“Hands up,” a command that demands a gesture of compliance, was resignified by activists as a gesture of protest following the 2014 police shooting of Michael Brown in Ferguson, Missouri. The act of resistance quickly made its way onto the football field and the Grammy Awards’ stage – even members of the US House of Representatives were using it to protest police shootings of unarmed Black men and women. 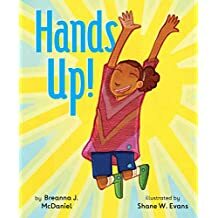 Breanna J. McDaniel makes this gesture of resistance available and accessible to children in her joyful new children’s picture book Hands Up!, which is warmly illustrated by Shane W. Evans to visually communicate exuberant expressions of family and community love. In Hands Up!, a young girl with glowing brown-skin is the clear star of the story. She is the sunny center of her family and community. Throughout the short picture book, the girl, her family, and her community put their hands up in various gestures of excitement, care, and protest. Her parents put their hands up to play peek-a-boo. Her grandmother gently guides her to put her hands up as they do her hair. In school, she throws her hands up, excited to share an answer with her class. After winning a basketball game, she stretches her hands up in pride, holding a trophy. This is a sweet-strong book. Young readers will enjoy the carefully worded text that reads like poetry. Older children will be encouraged to have socially relevant conversations about race and the abuse of state power after reading it. Image and text are in perfect harmony, communicating a sense of warmth and universal humanity where it is often denied. This is a book that can be read over and over, taking on new meaning as the child(ren) in your life mature. Highly recommended for personal and school libraries. Author Zetta Elliott provided me with a copy of the book to review. GIVEAWAY (Educators only, please)!! I received this awesome book for review and want to spread the love through a GIVEAWAY. If you are a K – 3 educator in the US, you can enter to win by following my blog (https://raisethemrighteous.com/), following me on Twitter (@jlmiller516), and reposting with a comment about how your class is celebrating black history this month. I’ll pick a winner 2/10!